In 1902, Mucha was commissioned to decorate a church in Jerusalem dedicated to the Virgin Mary. Shown here is the final version of Madonna of the Lilies, one of the murals for the church. The project was cancelled later for unknown reasons, so all that remains of this commission is this painting and earlier versions of it (Sakai City collection, Japan), as well as a design for a stained-glass window, Harmony, which is also in the Mucha Trust collection. 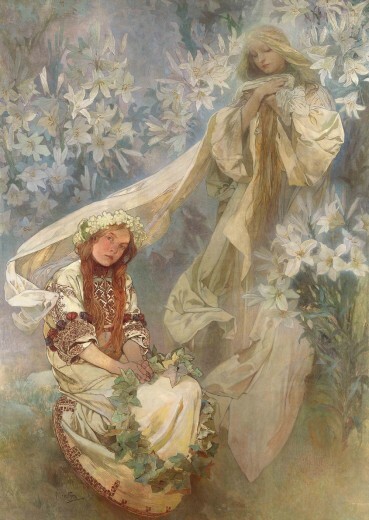 According to Mucha's letter to his wife Maruška, he conceived the subject as 'Virgo purissima', thus depicting the heavenly vision of Madonna, surrounded with a mass of lilies, symbol of purity. The seated young girl in Slavic folk costume carries a wreath of ivy leaves, symbol of remembrance. Her serious expression and strong physical presence contrast with the ethereal figure of the Virgiin.